Do512 Family Featured Babymaker, Catherine Prystup from LiveMom, is sharing her Top 10 Tips for Traveling with Kids with us today. If you have a big Spring Break planned, be sure to read this first! With spring break and summer right around the corner, I thought it might be a good time to talk about some travel tips that I have acquired over the course of my parenting career. Some tips have come to me by learning the hard way while others have been much researched. We travel as often as we can with our kids to enhance their worldview and offer a change of scenery. While “vacation” is just a technical term that I use (because no parent of a small child who is traveling with that small child will ever admit to a vacation being relaxing unless there is a full-time nanny along), it is a term that at least implies that a little bit of fun is to be had while traveling. To ensure that it’s not all stressful, my first tip would be: BE PREPARED FOR ANY TYPE OF DISASTER. Arriving in London in the middle of the night after 13 hours of travel with an exhausted child. A good stroller makes all the difference! And a comfy pillow helps, too. That means you should pack with the expectation that your child will get sick on your trip. Your child will have to go potty on the plane right at take off resulting in an accident. Did I mention that it can be fun? Let’s talk about packing for disasters. Smaller carry-ons were made perfectly to suit the little ones in our lives. Since their clothes are smaller, I’ve found that I can easily accommodate clothing for both my toddler and my school-aged child in addition to stuffing it with diapers and wipes. The reason I like to pack the kids’ clothing in a carry-on is so that I have a change of clothes handy for any uh-oh accidents. Carrying the spare clothes in the suitcase that is stowed overhead frees up space in your handbag/ diaperbag for other essentials that will be covered below. ∗ Tip: For diapers, bring enough to get you through the first 2-3 days of your trip and then buy a pack at your destination. Same goes for wipes. I typically pack one large container of wipes in the child’s suitcase with a smaller case in my handbag for use while in the airport/ airplane. 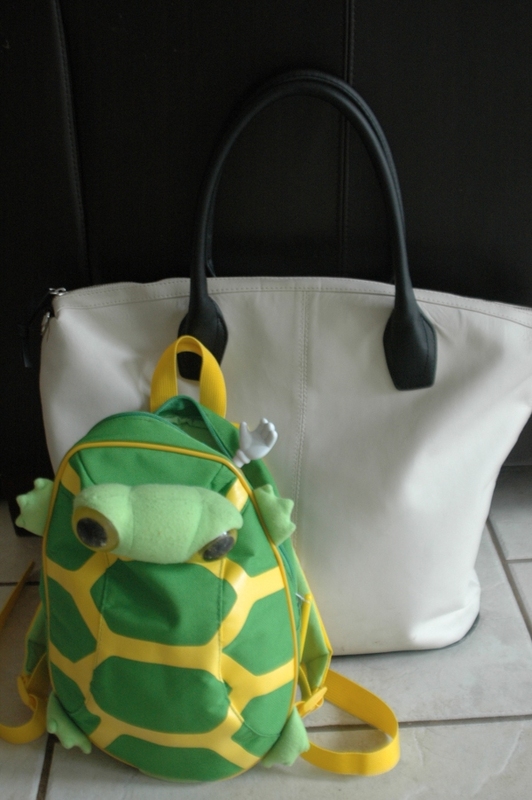 ∗ Tip: Pack one change of clothing for yourself and your travel partner in the child’s suitcase. There’s a double benefit to doing this: you have an extra set of clothing should your suitcase get lost AND you have a spare change of clothing should any uh-oh accidents happen while the child is sitting on your lap. Spilled milk, vomit (yes, not pleasant while traveling or really, any time, but it can happen), pee, poop….. not nice to wear while on a long flight. Now that we have the clothing taken care of, let’s talk about entertaining your child(ren) on the plane and in the airport. Pack ’em. Lots of them. On a recent flight we took to Europe I failed to pack anything more than a small container of Goldfish and two packs of M&M’s (emergency snacks). I have a toddler that consumes man-sized portions of food so it was a close call, people. Luckily, the Goldfish and half a pack of the M&M’s kept my toddler entertained long enough to get us through the ticketing line, which happened to be a mile long and took a half an hour when we got there since there were six of us traveling. Save the leftover Valentine lollipops for the next time you travel! 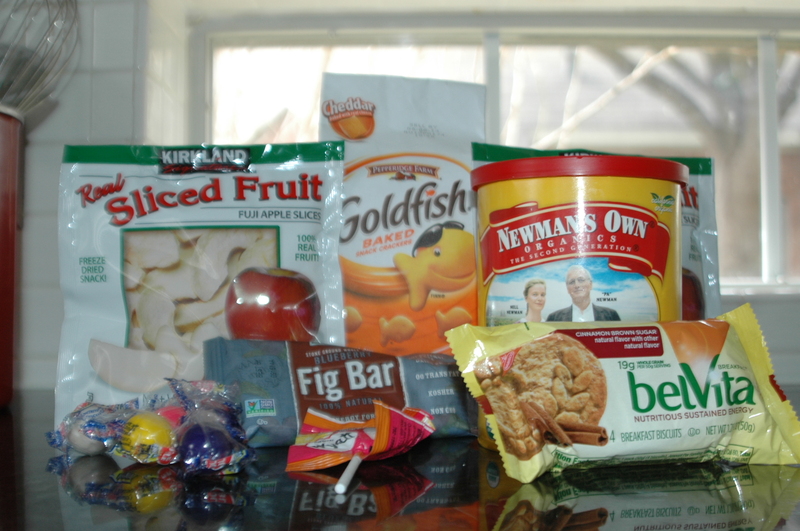 It’s a good idea to pack some healthy snacks as well as some emergency snacks- like my M&M stash. You don’t want them to have too much sugar and bad stuff, but you should have just enough to break out in case of an emergency meltdown at an inopportune time. I personally like lollipops as they take a long time to consume. Most importantly, pack things that your kids enjoy eating. With planes running late and sometimes mere minutes to dash through the airport to catch the next flight, having enough to sustain the kids is a great plan. Now, where do you store all of these snacks? That leads me to the next topic. ∗ Tip: Handbags, Backpacks and Travel Cases are essential on any haul, long or short. Choosing the right bag for each person in the family is important because those bags/ backpacks and cases will be carried or stowed beneath the seat for the entire trip. The rule in our family is one bag per person, including the toddler. A nifty trick: make sure the toddler’s bag fits into your bag. Of course, fifteen minutes into the trek through the airport, the toddler is going to complain about carrying their bag. So having room for it in a larger bag means that you have one less piece to keep track of. The little one can easily fit into the big one. ∗ Tip: Gadgets are good. We purchased a couple tablets over the holidays and loaded it up with movies that both kids like as well as books, music and games in preparation for our 18 hour trip to Europe. Bring headphones (they make little ones for kids). And DON’T STRESS about how many hours your kids are logging on the digital grandma while traveling. Really, if they are quiet and happy, the next step is to order a glass of wine and try to log in some movie time for yourself. It’s ok to be a little selfish on a long flight. I watched two movies back-to-back on our last flight over the holidays. It was wonderful! And I had a glass of wine for each movie, too. 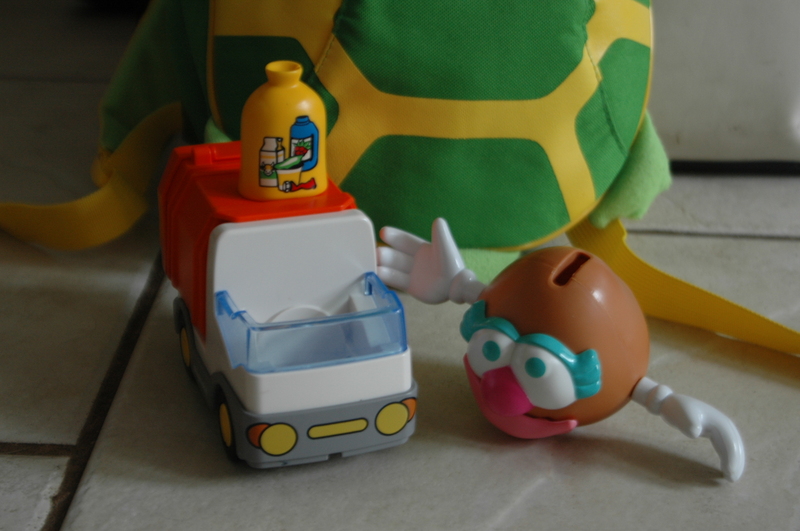 ∗ Tip: Toys… buy the kids a couple of new ones that you think will entertain them. There should be another trash can with this truck, but I believe it’s somewhere on a Turkish Airlines plane. ∗ Tip: Make sure those new toys or the toys that your kids pack do not have many small pieces that will fall and get lost on the floor of the airplane. Itty-bitty LEGO bricks, although entertaining enough- may not be easy to find when the little one decides that dumping them on the floor is more entertaining than building something. ∗ Tip: Passports, flight information, hotel and car rental information can all be placed into a folder or large envelope so that it is in one handy place in your bag. Make sure one person is in charge of the passports and tickets. We tend to get a bit flustered getting everyone through security so knowing Person A has the passports and tickets makes one less thing to remember. ∗ Tip: Stroller…. a good one is essential. We can make do with cheap umbrella strollers for walking around at home, but when traveling, it’s important to have a good quality, lightweight stroller. I prefer my strollers to have some cargo space and a few nooks and crannies for cell phone storage, drinks and snacks. Another thing to consider when purchasing a stroller with the intent to travel: make sure it is easy to fold. It’s kind of embarrassing when you hold up the line of people boarding the plane because you can’t figure out how to collapse the darn stroller. Pack things in Ziploc-style bags. -> They are sturdy and can double up as a container for a stinky diaper, dirty clothing, or for collecting trash (for those of you who are even OCD about too much clutter in your space on the plane). If you happen to have a window seat, window markers are excellent entertainment. -> They wipe off easily… and the wiping off is just as fun as drawing on the window. Pack medicine. -> I have twice had to travel with sick kids. It’s not fun. Bring the basics, especially stuff you rely on for your kids at home when you are traveling to a foreign country. There’s nothing worse than feeling helpless because you can’t figure out how to distinguish which container is Ibuprofen in Italian. Two options: Look stressed or make your kids look really, really adorable when going through security or passport control/ immigration. -> Even if you aren’t stressed or your kids are filthy, show the people in charge that you and your adorable family are about to meltdown; they might move you to the front of the line! It’s worked for us a few times. Worth a try! (I was most likely really stressed because…. 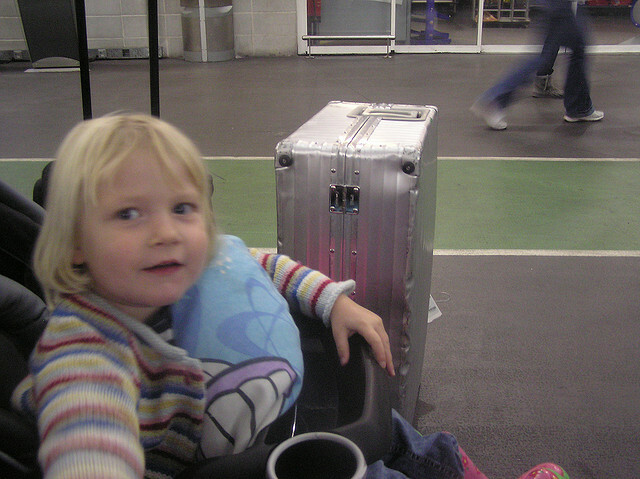 ah… traveling with a toddler!!) Enough said.